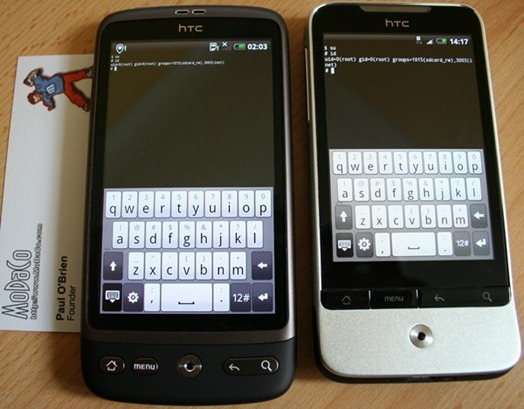 The two new Android phone – HTC Desire and HTC Legend have been rooted for full file system access on Android 2.1. Paul at Modaco forums has confirmed to have got full su (root) access on the said devices, and is currently going through final release mechanics before he makes it public for everyone to use. For those of you who don’t know, Rooting your Android phone gives you full access to the file system. This will enable you to modify the phone’s firmware to whatever you want to have on your phone like themes and apps which requires root access, and custom ROMs just like you do on a jailbroken iPhone. hi i just buy tmobile hts hd 2 can i jailbroken that phone. Waiting for your guide ..